Is it possible to remove footer “Designed by Joomla Templates – free”? I started to use this template for a Jom Social Community for my Church. For about a week, I had a java error and could not “share” using IE8. I found out, much to my great disapointment, that it is the template coding. Any chance we can look at the issue and get the problem fixed? simply change the logo image in the images folder. Installed template RedAura, but no graphics of the body nor do 3 columns show as the demo does. Is something wrong or is there something that needs changed in joomla 1.6? Check our “set module positions” page. i have a problem with a contactform. I’m using Joomla 1.6.3 german. 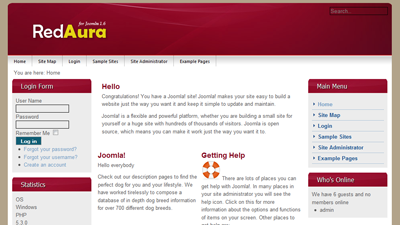 @Kaytan: use Joomla! 1.6.0 Stable version. 1.6.3 has some bugs. this is one of your best templates. Site looks not good in IE9. IE8 has no problem. What problem do you see Hans? Send me a screenshot. I’m sorry. The only thing i can paste here is text. The problem is that menu items not correct fold out. Also de pictures are only shown after i hit F5. @ Hans: please contact us with the problem. Hello, the problem is solved. I use ARI-Ext-Menu. With a small adjustment it is now just as i want it to be. Hi, thanks for the template. I had the problem that it did not produce valid HTML, I always had two extra tags on my pages. I therefore deleted lines 76 and 95 in index.php, now the HTML is valid and everything still looks ok (I am no HTML expert). Awesome template!!! I try to use phoca pdf on Joomla 1.7.2, but i have no pdf icon showing up. I tried also phoneapps. There is the same problem. If i take beez_20 it works. Do you have a solution for this? Thank you very much for your work!! !